How do I install this security update? Without this update, during the RDP connection to the computer the error “CredSSP encryption oracle remediation” appears (I’m trying to install the update on Windows 10 according to your article http://woshub.com/unable-connect-rdp-credssp-encryption-oracle-remediation/). 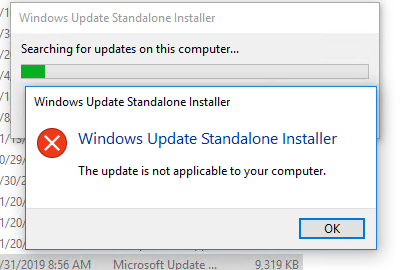 I can’t unequivocally give the answer why a specific update doesn’t applicable to your computer. But I’ll try to consider the main reasons why it is impossible to install a security updates in Windows 10 and how to solve your problem. So, the error “The update is not applicable to your computer” appears when you try to manually install an MSU update using the wusa.exe utility (Windows Update Standalone Installer). Why Windows 10 / 8.1 / 7 can assume that the update is not applicable? Regarding your case. It is not necessary to install exactly the update KB4103723. This is a cumulative update for Windows 10 1607 x64 from May 2018, respectively, you can install any later cumulative update for your version of Windows, because it already includes all previous updates. For example, you can install the update KB4480961 (January 2019) for Windows 10 1607. It makes sense to search Google for information on this Windows Update installation error code, you can also be assisted by a complete list of Windows Update error codes. Also, look for information about the update installation in the %systemroot%\Logs\CBS\CBS.log file (look for errors by your KB number).